Throughout your adulthood, it’s no doubt that you would have come across the James Allen brand one way or another, may that be heard of the name being mentioned in conversations or browse the website yourself before. James Allen is not only very popular among Americans but it’s also known internationally. James Allen is competing in the same market as Blue Nile with their similarity in website design and user experience, engagement ring designs, and price points. From James Allen’s website color scheme and tone of voice, it’s clear that millennials are its target audience, and the brand is selling the romance in diamonds and engagement rings. Part of the secret that sets James Allen apart from its competitors perhaps lies in its timely emergence onto the web. While the site was initially launched in 1998, it underwent an entire rebranding in 2006. James Allen re-approached the market with an understanding of e-commerce and its ever-growing hold on consumers. Shoppers entered the site armed with far greater product knowledge and understanding of what to expect from the experience. In response to this, James Allen attempted to match the level of luxury and care that one may find in a ‘physical’ jewelers. It focused on the higher quality diamonds, understanding that the margins of online purchase gave consumers more money to play with, thus a desire for bigger, better gemstones. In August 2017, Signet, the world’s largest diamond jewelry retailer, acquired James Allen on a $328 million cash deal. According to the press release, this acquisition will see Signet and James Allen to further enhance online shopping experience with their “Customer-First OmniChannel strategy”. It is impossible to ignore the huge wealth of similarities between James Allen and Blue Nile. 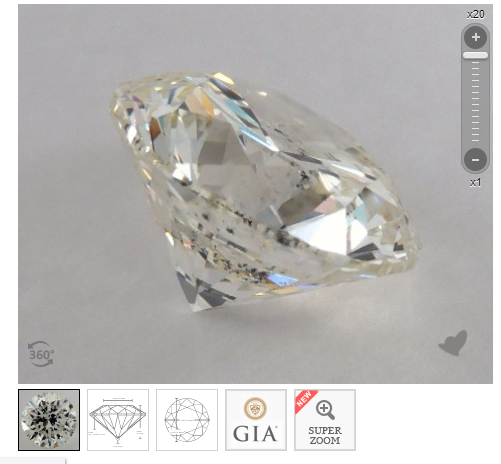 They stand alone in the online diamond industry, offering similar levels of choice and flexibility. Both sites are entirely integrated, and it can go almost completely undetected that the diamonds we see featured do not ‘belong’ to either retailer. Rather, they are a database of possible purchases; this allows for unparalleled choice. Blue Nile holds a greater ‘stock’ of diamonds, while James Allen offers a little more security and clarity before purchasing. In principle, the business models are largely the same; however, it is clear from the first click that James Allen has opted for finesse and luxury with customer experience being paramount to its endeavors. Beginning with a setting, James Allen follows Blue Nile’s theme and allows the same extensive filter options for choosing a diamond. 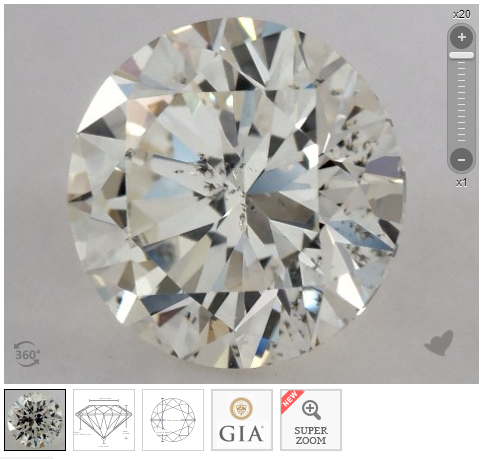 James Allen now offers the 360° diamond view that was first used by Blue Nile; however, it is its imagery that set it apart from other loose stone sellers. The lens used to photograph the diamond is extremely powerful; it is as effective, if not more so than a jewelers loupe. 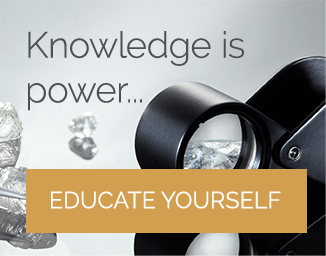 The high-quality images used by James Allen allow even a diamond novice to assess the inclusions within the diamond with ease. James Allen has invested millions into its technology, including outsourcing to an office in India, where its diamonds can be photographed 24/7 from its vendors. It is yet another example of James Allen’s focus on quality and customer experience. Each diamond is assessed, photographed and filmed by experts to ensure a consistently high-quality stone is presented across the website. James Allen’s quest for luxury and exclusivity continues with its impressive collection of fancy diamonds. Rare, expensive and unusual, James Allen offers a rainbow of gemstones with the same abundance and quality as its colorless stones. In this way, it set itself apart from competitors, adapting to the times and understanding the need to break tradition in modern jewelry. While Blue Nile drives focus towards sheer quantity, James Allen chooses rather to place emphasis on overall quality. This is reflected across its website, in its products and its prices. It goes without saying that you will pay less with James Allen for a diamond of the same quality in a traditional brick and mortar jewelers. However, it is the overall finish that makes James Allen top of the e-commerce choices for jewelry, in particular, engagement rings. When it comes to replicating an in-house experience, James Allen is unrivaled. With sleek leather boxes, a designated drawer for certification and foam inserts, they guarantee not only a safe arrival but an impressive presentation. The magic of purchasing a piece of fine jewelry was once lost through e-commerce; however, it is passionately reignited by James Allen. The importance of the contents is palpable, and the consideration that has gone into the top down design from website to packaging is evident throughout the buying experience. However, James Allen does lose points for other areas of its customer service. While it has vowed to work on the issues that have been raised, complaints of poor communication throughout the delivery process continue to arise, which can be a huge concern for buyers, especially internationally customers. While Blue Nile caters to those working on a budget, the sky is the limit with James Allen. Its prices comfortably accommodate for a smaller budget, but also offer stand-out, exceptional stones for those looking for something extremely special. It is worth noting that a side-by-side comparison of Blue Nile and James Allen does not reveal any large differences in the pricing of their stones. However, James Allen’s completed pieces of jewelry do command a higher price than its competitors. This is perhaps a reflection of the overall experience and the expertise that goes into its products. Its state-of-the-art imaging, well-documented certification options, and expert guidance allow the buyers to get exactly what they are paying for, and at an incredible price. 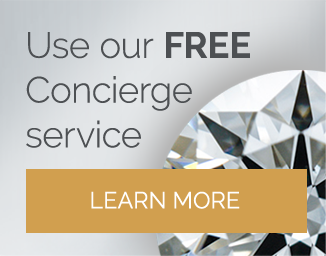 An eye clean diamond can be easily found using its clean cut and comprehensive website. That said do they have the best quality diamonds available? The answer is no, whilst the quality is very high the Whiteflash A CUT ABOVE® diamonds are meticulously analyzed for superior quality and performance. 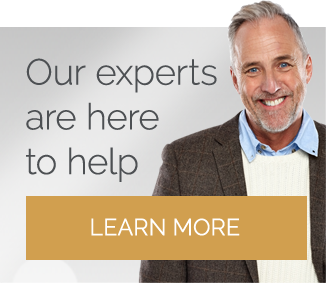 It is easy to view James Allen’s impressive marketing and website experience as the whole package - a retailer that truly cares about every step in the buying process. However, this is perhaps not the case. While the quality of James Allen’s diamonds is evident, there are other key areas that need work, such as complaints of cheap and weak settings taint the retailer’s otherwise impressive reputation. When such huge investments have been placed into the website, packaging, and state-of-the-art technology, one may wonder what corners have been cut to allow James Allen to make a profit. It is here that the issue of craftsmanship is addressed. A stunning diamond of high-quality is an investment. But, when said stone is in a weak setting and at risk of falling out and getting lost, suddenly the glitter and appeal of James Allen is greatly diminished. The saving grace is a continued strive for returning customers; any issues will be ironed out, fixed and re-set in order to maintain the company’s reputation. Such complaints are not commonplace, but it is clear that greater attention to detail is needed regarding the overall finish of James Allen jewelry. As with all in-house cuts, there is a premium to be paid for these stones. Unlike Whiteflash, James Allen does not specify the exact data or requirements for a stone to be considered a True Hearts diamond. On close inspection of the stones, it is clear that its diamonds within this collection are certainly of a high cut quality, but this comes without the same technical data as provided by Whiteflash. Some of the diamonds are of a ‘near’ Hearts and Arrows formation. Make no mistake, the diamonds in question will be beautiful, just without the same guarantees offered by Whiteflash. James Allen holds your hand throughout the shopping experience. With individual engraving options, lifetime warranty, free international shipping and multiple payment options, it truly has covered all bases. As previously mentioned, it is its communication that lets it down. Delays, unanswered emails and a lack of updates can leave buyers feeling concerned, and rightly so. While these complaints are in the minority, they do present themselves with more frequency than other diamond jewelers. When it comes to online engagement rings and diamonds, it is fair to say James Allen has set an impressive bar. The extensive style options, combined with its extremely high-quality stones appeal internationally, and its innovative and detailed approach to customer service rounds of the experience with an undeniably professional glow. Customers may face issues with ring sizing, as is the nature of an online purchase, but I have no doubt that when the technology becomes available to iron out this crease, James Allen will be one of the first to invest. While James Allen attempts to replicate a brick and mortar jewelry experience, it is yet to truly deliver on this promise. Quality diamonds and attractive branding aside, there is an element of ‘rolling the dice’ when it comes to the finished product. For every handful of glowing reviews, there will be one dissatisfied customer whose stone has come loose from an inferior setting. Nevertheless, James Allen remains a top choice for buyers, and will continue to strive for the ultimate customer experience. Before making any purchases, do read my reviews on other jewelers such as Whiteflash and Blue Nile, as I've said in this review Whiteflash have a better quality cut diamond with their A CUT ABOVE® Diamonds and if you're looking for something a little cheaper then Blue Nile is your best bet.